Purpose: Ion Foot Detox may improve overall health and well-being from detoxification of the body. Detoxification may include from your joints, which may help with the effects of arthritis; may reduce yeast; may promote lymph; and may promote restful sleep. If you are on a “detox” diet or program, this may help improve your results. $35 for a 30 minute session. For more information, please continue to read. The Ion Foot Detox treatment will last 30 minutes. Your feet are submerged in warm water while you relax. It may alkaline your body, lower blood sugars, and lower cholesterol with regular use. Your response is unique. An interesting test may be to check the pH of your urine before a session and then 48 hours later. Try not to eat or drink any acidic foods/beverages after a session. With continued use of the Ion Foot Detox, your body may become less acidic. Those with fungal or yeast infections, GI disorders, high cholesterol, parasites, acidic pH, diabetes (Type 1 need to use with caution), allergies, and arthritis may benefit. How often should you get an Ion Foot Detox? Most clients start with one a week for a month then once a month. If you add it onto your existing session, you will save $10 off the service price of $35. You may feel relaxed after the session and possibly sleep better. No children under 12 please, or anyone with a pace maker or an electrical implant, Type 1 diabetes (doctor permission please), open wounds or sores, lesions or rashes. It operates on the principles of electro-chemistry. The foot spa array produces negative and positive charged ions. 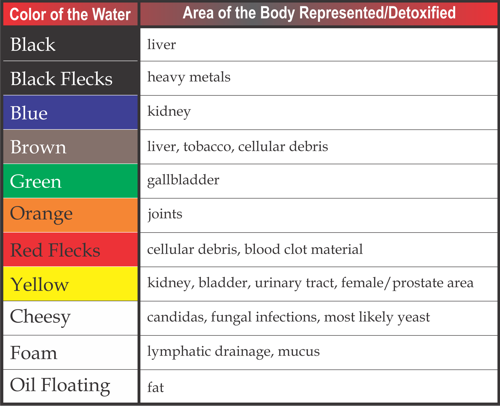 The detox will manifest itself in the water. See the chart below. It will continue to draw out the toxins for 24 hours after a session. They will be eliminated through the urine. Call Karen today at (618) 696-6411 or complete the Contact Form to schedule your ion foot detox session. We understand that events occur that may prevent you from keeping your scheduled appointment, however, management reserves the right to charge for the session fee in the event of a no show.